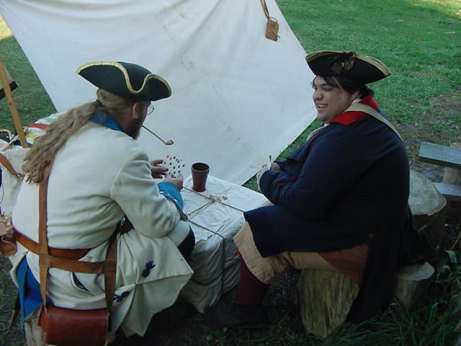 One the Right is an artist depiction of what French militia would have looked like in 1750, and on the left is a picture of Reenactors today portraying the same people as they would have been. Chemise: A knee length cotton or linen shirt, considered to be an undergarment. Culottes or Breech cloth: A pair of knee length pants, usually wool or linen, which button around the knees, or a cloth worn over the loins. and/or Mitasses: A pair of protective garters worn over the lower legs, made of leather or wool, which button to the breeches or tie to a belt. Moccasins or Sole de Bouef: Leather slippers made in the native style with a center seam, or loafer style shoes made of ox hide. Guillette: Small short vest, worn over the Chemise. Usually with out sleeves. (See the picture of unit member Jean Phillippe on the unit members page for a good example). Capote or Justacorp: Heavy coat with large cuffs worn over all else, kind of like a suit coat. A Habitant would also carry a haversack or purse, which was a bag or pouch with personal belongings. Milice on campaign would also carry a cartridge box, for ammunition, a large knapsack for extra supplies and a musket. Jupon: A garment very similiar to a skirt, only shorter. Many of these could be worn at once to show wealth and status. Chemise: An underskirt or shift worn under all of the outer petticoats and the jupon. Mantelet: A short women's waistcoat, worn with the jupon and chemise. Fichu: A square or oblong piece of cloth used by women as a modesty scarf worn about the neck and shoulders. 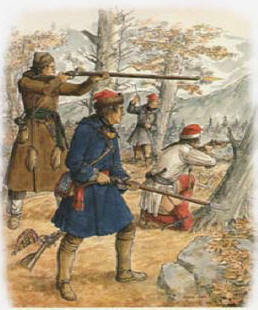 The traders of New France “appear to have been a unique blend of French and Indian, wearing Indian dress, traveling like Indians, eating the same sort of food, speaking their languages, making war in the Indian manner, living off the land and enduring privation with the fortitude of the Indian”. 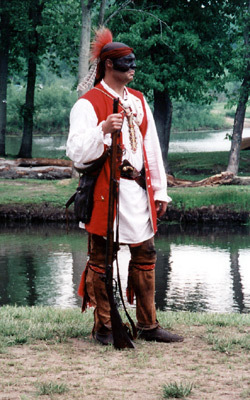 In addition to the above articles of clothing the typical Habitant, man or woman, living on the frontier would wear "Native Style" dress as well. This could be just a pair of moccasins or beaded bag. Or the Habitant might be indistinguishable from a Native person except for skin color. 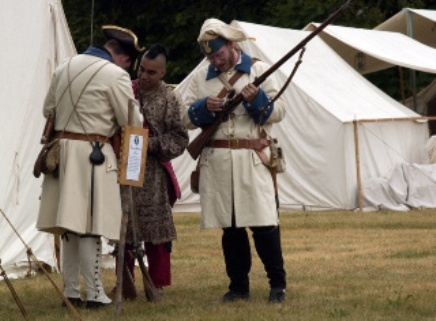 It was not so much that the Habitants dressed like Natives, but that they both dressed like each other. Each culture borrowing clothing ideas from the other until a composite wardrobe was reached.